It is hard not to fall asleep watching promo videos for smartphones. That's why we rarely write about them. Today we make an exception for the new OnePlus 5 camera ad, which, depending on how you look at it, is either really stupid or brilliant -- but memorable nonetheless. Called Lake Blood, it's the story of a chainsaw massacre. 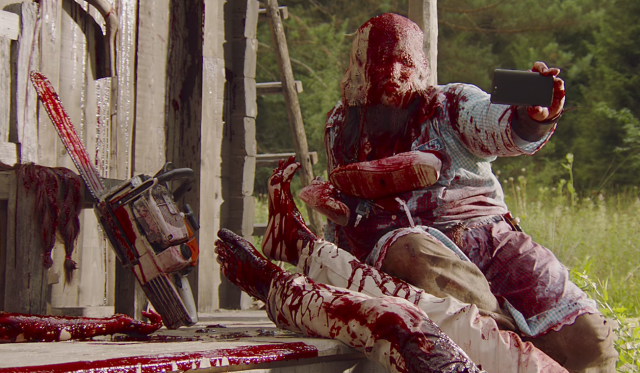 The promo features a teenage girl, a bloodied man and the chainsaw killer that's following him. It's not your typical combination of characters, is it? The idea behind the ad is that the OnePlus has such a good camera (or dual cameras, I should say) that you really don't want to snap important moments with a lesser smartphone. And that it's worth dying to get people to use it -- at least that's the message I'm getting. The girl sees the man running towards her, so she pulls out what looks to be a Samsung Galaxy phone to take a photo. The man, clearly in distress, asks "What's wrong with you?" as he's approaching her, hits her hand, she drops the phone, says "You could be using one of these," and gives her his OnePlus 5 to use instead. Some OnePlus 5 praise follows, a photo is taken, and the promo ends with the killer taking a selfie next to his chainsaw and the two victims. Yes, it's that kind of an ad. The first time that I saw it I thought that OnePlus must be insane. But the purpose of the video is not to be boring, it's to cause a strong reaction and, hopefully, get people talking about the OnePlus 5's camera. To that end, it works. Question is, does it make the case for the looking into the OnePlus 5 or does the video itself eclipse the smartphone? Watch it below and drop a comment with your impressions.